Digisol’s latest product launch is an apt instance demonstrating the phenomenal growth of IP camera market. The 100%-owned company of Smartlink Network Systems just released its new Dome IP Camera with an Audio and SD card slot. This camera has been designed to be used in office and home security and other monitoring applications, as it offers highly effective surveillance solutions – much better than its conventional analogue CCTV units. Endowed with better picture quality, video analytics and flexibility, these products have been quickly taking over the mantle from traditional security and surveillance cameras. In consequence, IP camera market has been emerging as a ripe investment ground for shareholders. Lately, owing to the integration of the Internet of Things and advent of smart spaces, IP camera market outlook has been projected to witness a massive transformation of sorts, both in terms of product quality and expense. Prominent companies partaking in IP camera industry have been working toward increasing network compatibility and bringing down camera costs. However, initial expenditure notwithstanding, the revenue graph of IP camera market will continue to remain exponential over 2017-2024. One of the pivotal reasons for the same is that one IP camera is equivalent to three to four analog cameras - a fact that is enough to offset the high initial costs of IP cameras. The rationale for the security industry to gradually shift from analog to IP cameras is to ensure the security of larger facilities. Owing to the limitations faced by coaxial cables, the cost of installation of analogue cameras is dramatically higher when the facility to be secured is spread over a larger area – say, schools, universities, military bases, museums or corporate campuses. In this regard, IP camera market has gained commendable prominence, since the product eliminates the need of proprietary networks that were a mandate for analogue cameras. In fact, a study estimates that the cost of large scale surveillance project installations can be brought down by $1000 to $4000 by using IP cameras over analog transmission systems. IP camera market is expected to witness an appreciable growth rate from the residential sector. 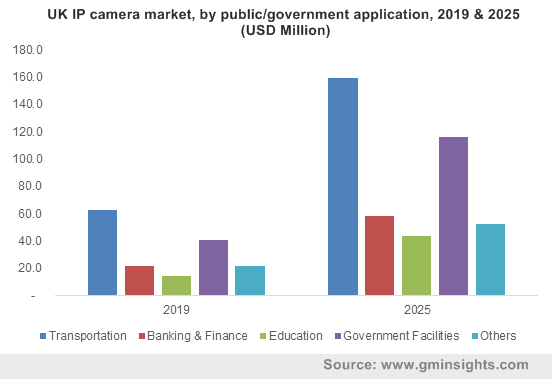 Continuous innovations in these products along the lines of facial recognition, intrusion alert, motion, and object detection will drive IP camera market size from smart home applications. Indeed, the smart home industry has been advancing at a phenomenal rate, bringing about a plethora of avenues for IP camera industry players. Say for example, leading companies such as Scenera, Foxconn, Sony Semiconductor Solutions, Wistron, and Nikon have recently announced a collaboration through which they intend to launch next-gen smart cameras for home security. It is pivotal for prospective stakeholders to take note of the fact that IP camera industry has garnered immense traction owing to the product’s image resolution. Incidentally, even the lowest resolution IP camera provides four times better resolution than analogue cameras. On these grounds, the casino industry has been adopting these products on a large scale to read facial cues and eliminate the incidences of cheating. Crimes related to gambling and the like now stand a better chance of being resolved as faces and license plate images are much better captured using IP cameras. Ease of product installation is one of the significant factors driving IP camera market size. Many of the modern IP cameras are installed using a mere plug and play functionality with a single cable. Indeed, this is one of the most winning features of these products that has led to their mass appeal among consumers. Having recognized the same, established biggies as well as new entrants in IP camera industry have been striving to innovate products that can be installed with even more convenience and simplicity than their predecessors. The widespread penetration of IP camera industry is rather evident from the fact that these products are lately being used for baby and pet monitoring. IP cameras with integrated IoT system can be used not only for monitoring but also for communicating with babies/kids using the pan, tilt and zoom, and two-way audio features. Indeed, some pet cameras come in with a push button that enables pets to schedule a call with their owners. As technology continues to advance, IP cameras are expected to become more affordable in the ensuing years, with increased competitiveness. With security issues becoming a global matter of concern, the deployment of high-quality surveillance systems is becoming more pivotal than ever. On these grounds, it would be apt to state that the growth prospects of IP camera market seem to be rather lucrative. Indeed, the advantages that IP cameras possess over traditional CCTV cameras will enable this business sphere to exceed a valuation of $20 billion by 2024.